In the Church of England church buildings are submitted to a Quinquennial - five yearly - Inspection by an appropriately qualified surveyor who then prepares a detailed report on all aspects of the condition of the building’s fabric and contents. This is then sent to the Incumbent and the Parochial Church Council (PCC) for consideration. Typically, parishes address the issues raised in such a report in order of priority and in proportion to the financial resources available at the time. inspection reports, and is long overdue. The intervening years have brought further deterioration of certain materials as well as ever increasing costs. The extent of the scaffolding covering each side of St Matthew's Church during the past year was an indication of the nature and extent of the Quinquennial works. The scheme was originally scheduled to take twenty weeks. The estimated cost of the works, inclusive of VAT at 20%, was £216,538.72. However, the latest element of high level repairs has been at the highest level of all, 170 feet up, at the top of the spire, involving costs additional to the original quotation of up to £30,000. This has entailed replacement of masonry and the insertion of stainless steel mesh guards to stabilize the structure, working from the most precarious-looking crows-nest of a scaffold. All of this was completed with the re-installation of the original golden cockerel at the top which gleamed in the sunshine on a fine Spring-like morning, on Tuesday 5 March, 11 months after the start of the whole works project. During the course of these repairs to the spire steeplejacks found a time capsule embedded in the stonework. Dating back to 1894 this contained a newspaper, coins and a piece of wood signed by workmen who originally built the church. It has been decided to create a new capsule to have placed within it a parish magazine and some of today’s coins and photographs which will be left in the walls before the scaffolding is taken down. St Matthew’s Church is Listed Grade II*, and as such is worthy of the care, attention and investment that will secure the long-term future of this inheritance for successive generations to appreciate. The PCC takes seriously its commitment to maintain and develop our spiritual home, and in this instance has funded these repairs and improvements from legacy funds held by St Matthew’s Trust. The PCC is seeking also to defray the cost by applying to appropriate charitable trusts, and warmly welcomes the generosity of well-wishers from within the parish community and further afield who value the spiritual, cultural and artistic heritage this work will help protect and encourage. ▪ Overhaul of tiled roof slopes, attention to leadwork in gutters and flashings. Stonework repairs to parapet walls, copings, pinnacles and chimney. ▪ Improvement to access, notably involving the hitherto inaccessible valley gutter between the south transept and organ vestry roofs. Also provision of a fall arrest system to the chancel gutter apse parapet gutter. ▪ Stonework repairs to the flying buttresses above the north aisle roof. ▪ Steeplejack’s inspection of spire fabric. ▪ General stonework repairs to walling and windows etc. externally including some glazing repairs. ▪ Attention to rainwater goods. ▪ Provision of new bird guards to the lower spirelights together with other minor works at belfry level etc. ▪ Remedial works in chancel roof void. ▪ Minor stonework repairs etc. to walls, windows and doors internally. ▪ Attention to quarry tile and wood block floors. ▪ Minor attention to screens etc. 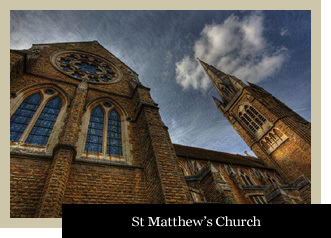 St Matthew's and how the church serves as a spiritual and cultural hub. Discover the areas of responsibility encompassed by the Parish Pastoral Team. St Matthew's church in aid of securing the future of this Grade II listed building and spiritual home. View photos of the remedial work currently being carried out. Celebrate an anniversary or remember a loved one with flowers or by floodlighting the Church for the evening.